1. From Admin, click Policies. 2. Click the New Policy button. 3. On the Details tab, give the policy a name. You can also add an optional description for that policy. 5. Navigate to the Acceptance tab. 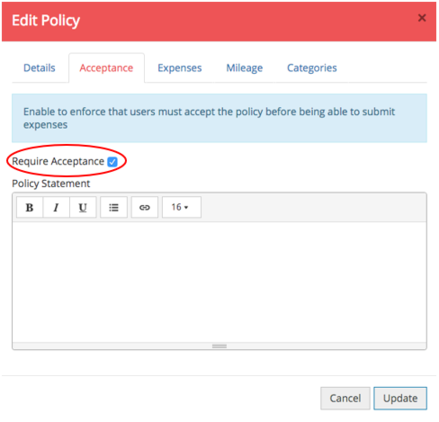 This is an optional feature that will allow you to add a policy statement for your users to accept. 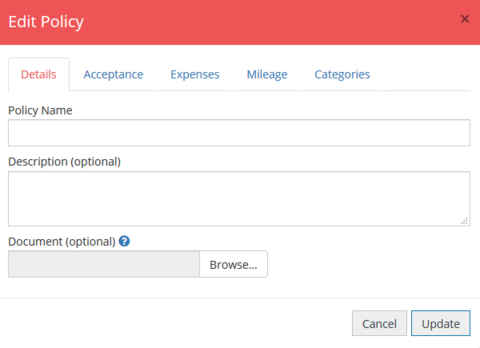 Tick Require Acceptance so that your users have to accept the policy prior to submitting their expenses. If you amend the policy statement, click Users must reaccept policy. 6. 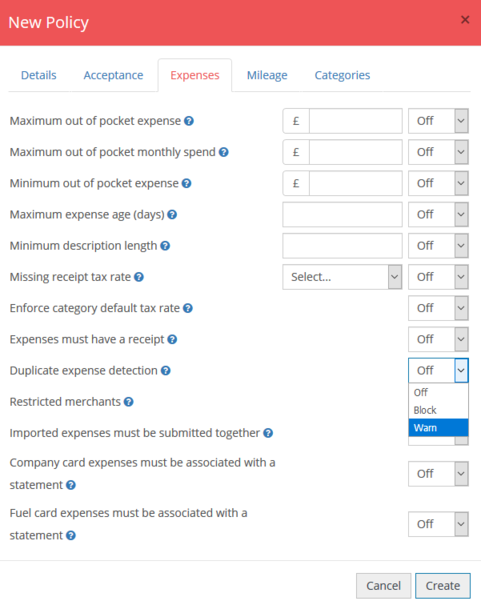 Navigate to the Expenses tab to customise your policy. You can set your policies by choosing either block or warn. For more information on the policy rules hover over the question marks. Please note: Enforcing postcode locations is only applicable to postal codes within the country your ExpenseIn account was created. 7. 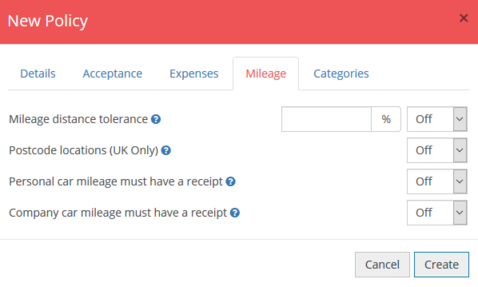 Navigate to the Mileage tab to set policy rules that apply to mileage expenses. 8. Navigate to the Categories tab to set limits on your categories. If you haven't already, make sure you have added all of your categories first. You can select whether the limit is per expense, day, night, or attendee. Click Create to add that policy to your account. Now that you have created your policy, you will need to assign this to your users. In Admin, navigate to your Users section. 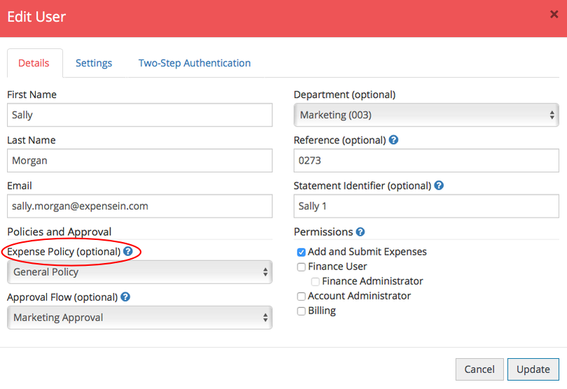 Choose the users that belong to the policy you are assigning by selecting them (tick the box next to their name). Click the Actions dropdown and select Change Policy. Select the policy you wish to assign from the dropdown list. Alternatively, you can individually click Edit next to your user's profile and select the policy there.